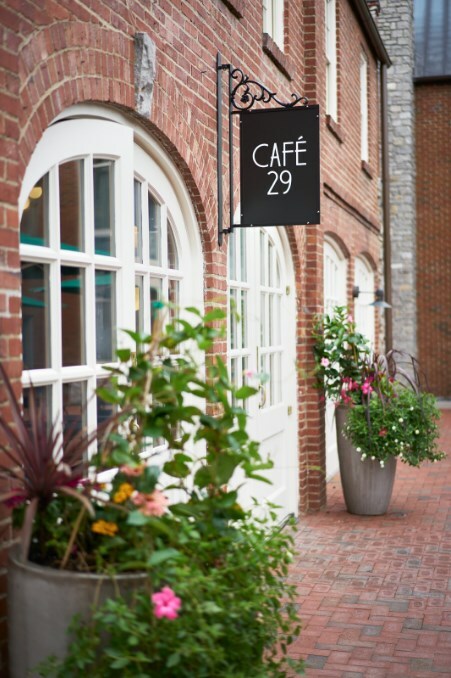 Officially open to the public, the new Café 29 at Cheekwood is operated by French-American bar and restaurant Sea Salt. The café is located inside the newly restored Frist Learning Center Courtyard, and is open during Cheekwood’s operating hours, from 9 a.m. to 4 p.m. Tuesday – Sunday, and offers a casual, made-to-order menu including soups, sandwiches, salads, smoothies, baked goods, a children’s menu, snacks, coffee selections and alcoholic beverages. Tuesday – Sunday 9:00 a.m. – 4:00 p.m. The café will remain open during Cheekwood’s extended hours for public programming. The cafe is accessible with a Cheekwood membership or general admission ticket. Cheekwood members receive a 10% off discount in our café and gift shop! *Menu items subject to change. Indoor and outdoor seating is available in the café and the Frist Learning Center Courtyard. The café features picnics to go with a convenient pick-up window. With sustainability top of mind, the café uses locally-sourced ingredients, and serves food in recyclable or compostable packaging. Café 29’s coffee drinks features the original Maxwell House coffee blend, a tribute to the coffee that helped create Cheekwood. Leslie Cheek, who ran his family’s wholesale grocery distribution C. T. Cheek & Sons, had invested in his cousin Joel Cheek’s Maxwell House business. Upon its 1928 sale for $45 million, Leslie’s already existing fortune expanded. A vibrant display of historic imagery and interpretation on Cheekwood connections to Maxwell House can be found in the new café. The name Café 29 pays homage to the year 1929, when the Cheek family broke ground on the estate. For questions, contact cafe29@cheekwood.org.